I Still Don't Want an Apology. I Want a Voice. 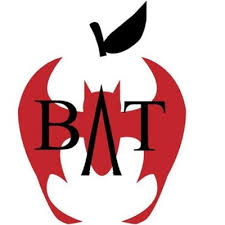 In 2014 Time Magazine ran a story called Rotten Apples about how difficult people claimed it was to fire bad teachers and how some folks were working to change that. Teachers were insulted. Teachers were up in arms. Teachers demanded an apology and a retraction. Now the governor of New Jersey is quoted as saying the teachers’ union deserves a punch in the face and he wants to become president of the United States in order to be the one to do it. Teachers are insulted. Teachers are up in arms. Teachers are demanding an apology. I doubt one is coming. I wrote in response to the Time article that I didn’t want an apology. In that response, I wrote about a telemarketer who called my home not once but twice, the second time to deliver racial slurs and use profanity. All of the “I’m so sorry’s” that I heard up the proverbial food chain to get to this person’s supervisor didn’t change what had already happened. I don’t need or want an apology from the governor of New Jersey. You see, I teach students. One of the many lessons I teach my students is that bullies have low self-esteem. They threaten and put others down because they don’t have much to stand on. I teach them that there will always be ones who channel surf, who point the remote at someone and push the buttons looking for a reaction. When they get the desired reaction, they sit back and watch like it’s great entertainment. All they need is the bucket of popcorn. I tell my students that the best response to the channel surfer is to be boring because then the channel surfer will become bored and point the remote at someone else. I teach kids to be spoons players. I teach them to shield each other from bullies through banding together and make friendship look a whole lot more fun than what the bullies are doing. I teach kids that an apology only means something if it comes with a positive change in behavior. So, no, I still don’t want an apology. I still want what I wanted when Time ran its article. 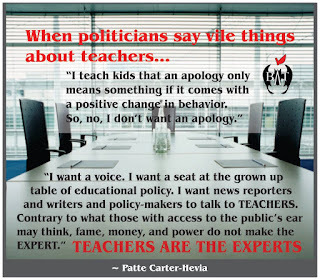 I want a seat at the grown up table of educational policy. I want news reporters and writers and policy-makers to talk to TEACHERS. Contrary to what those with access to the public’s ear may think, fame, money, and power do not make the EXPERT. He then turned, walked away, and never looked back. I’ll save my anger. I’ll use my energy to worm my way to the grown up table. I’ll use my voice to create change. And to the governor of New Jersey, I will quote someone who continues to be wise beyond his years.